A consortium of communities in Michigan figured out that building their own fiber network would save them millions in taxpayer funds, but if you read the article, you get the distinct impression that Verizon believes the purpose of government is to ensure that Verizon never has any competition. Apparently, Verizon believes government should never try to save money and never try to do things differently if there is any impact on Verizon's bottom line. The clue that something is amiss is the huge costs savings the local governments gain from building an entirely new network--an expensive undertaking. Verizon, in many areas of the country, has chosen not to invest in new infrastructure, effectively forcing communities and businesses to continue to pay high prices for old, 19th century copper technology. 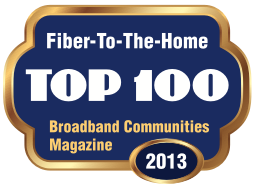 Done right, community fiber systems can not only save taxpayer dollars but also be a huge boon for businesses, who could get access to less expensive voice and data services from competitive providers. In the studies that Design Nine has been doing for communities, when you look at the forty year expected life of fiber, the multi-million dollar cost of a fiber system is a fraction (typically less than 5%) of what business and government will pay for telecom over that same time period. And it's a lot less expensive than water and sewer projects, which communities build and manage routinely. Who do you want deciding the economic future of your community? You, or Verizon? Michigan gets a hat tip for its Cool Cities program. They apparently not only read Richard Florida's Rise of the Creative Class, but also decided not to just keep doing the same old thing and expecting different results (a typical economic development response). The Cool City principles are worth reading. Written like a vision statement, they identify key ideas and concepts that the effort intends to pursue. It is too early to tell how all this will work out. The Cool Cities Web site, while "cool," is annoying because on the two browsers I tried, anyway, I'm forced to read everything in a tiny little window. This is a bad sign; it suggests that the first thing they did was hire some "cool" Web designers who don't understand the first thing about usability. It is NOT cool to put coolness ahead of common sense, like "we want a page that is easy to read." The second thing that concerns me is that there is much talk about marketing Michigan cities as "cool." I'm a big fan of marketing, but marketing should be driven by results, not marketing for marketing's sake. Coolness should be defined by the services, amenities, and people that communities have, not by a pre-determined set of marketing slogans. But Michigan is trying something new. There will be some missteps, but if they are determined to learn from them, it will be an interesting experiment to watch. How about your region? Are your leaders and economic developers thinking outside the box, coming up with completely new approaches to economic development? The Detroit News has a report on a Michigan legislator who has introduced a bill to ban local governments in the state from getting involved in wireless efforts. The article does not shed any light on what the motivation behind the bill is, but the wireless project in Oakland County which is described in the article is worth reviewing. The article cites "experts" who all agreed that it would cost $50 to $100 million to provide wireless throughout Oakland county. There are several things wrong here. First, it is very hard for me to take seriously the estimate of an "expert" whose figures may be off by 100% or $50 million. That does not sound like an expert to me. If the county, which is considering the wireless initiative, can't get better numbers than that, it hurts their efforts by publicizing such vague estimates. I have a hard time with "big bang" projects, where the whole county just wakes up one day and has broadband wireless (hence the big bang). Typically, a public sector or private sector project ought to start with a modest investment and expand incrementally as demand builds, using revenue to finance expansion. We have very few examples (if any) of wide area wireless networks and the expected take rate (how many people sign up for the service and how fast). Spending even the low figure of $50 million in advance of understanding the market is risky. Wireless, much more than fiber, ought to grow in response to market demand. Using this kind of vague estimating, most communities would never have been able to get public water, sewer, or good roads. Someone would have said, "It will cost $100 million to run water to every home in the county, and there's no way we can afford that." Of course not, but no county in the country ever tried to run water to every home in a year or two. Oakland County should get some deserved credit for thinking about addressing broadband needs systematically, but a go-slow approach may yield more benefits with less risk and private sector investment. There are a lot of good community projects in Michigan, and places like Grand Rapids and the work of visionaries like Ray Hoag and Dirk Koenig have been leading the way for years. This anit-muni bill should die a quick death, or the communities of Michigan will lose, as will the state, as businesses head elsewhere. Oakland County, Michigan (via Muni Wireless) has issued an RFQ for wireless services to provide broadband throughout the region. It's a public/private partnership, which is the right way to go--government provides leadership and helps ensure universal (or nearly universal service) and the private sector creates jobs and pays taxes. Here's an excerpt from the County's Web site, which shows these county leaders "get it." "....[the wireless service] will enhance Oakland County's ability to attract and retain high-tech and nanotechnology corporations. Wireless Oakland will also enhance the residential character of our local communities and further distinguish Oakland County as a great place to live, work, and play. It will support a growing mobile workforce and elevate the technical knowledge of its current and future workforces." Oakland County has identified a technology cluster (nanotechnology), recognized that they have to invest to make that economic development cluster grow, and goes further to recognize that technology enhances quality of life. This is the competition, right here in America. Some U.S. communities are getting smart about this, and are going to start pulling businesses from other regions.